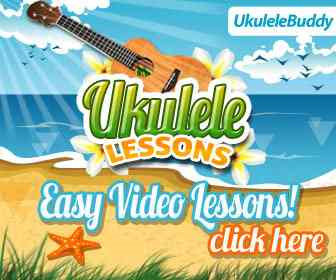 Ukulele chords and ukulele tablature made easy. Ukulele Songs is a search engine for finding ukulele chords and ukulele tabs. The ukulele, variantly spelled ukelele (particularly in the UK), or alternately abbreviated uke, is a chordophone classified as a plucked lute; it is a subset of the guitar family of instruments, generally with four strings or four courses of strings. The ukulele originated in the 19th Century as a Hawaiian interpretation of small Portuguese guitar-like instruments. It gained great popularity elsewhere in the United States during the early 20th Century, and from there spread internationally. The ukulele is commonly associated with music from Hawaii, where the name roughly translates as "jumping flea". It was developed there in the 1880s, based on several small guitar-like instruments introduced to the Hawaiian Islands by Portuguese sailors. The ukulele was popularized for a stateside audience during the Panama Pacific International Exposition, held for most of 1915 in San Francisco, at which the Hawaiian Pavilion featured a guitar and ukulele ensemble, George E. K. Awai and his Royal Hawaiian Quartette, along with ukulele maker and player Jonah Kumalae. The popularity of the ensemble with visitors launched a fad for Hawaiian-themed songs among Tin Pan Alley songwriters. The ensemble also introduced both the lap steel guitar and the ukulele into U.S. mainland popular music, where it was taken up by vaudeville performers such as Roy Smeck and Cliff "Ukulele Ike" Edwards. The ukulele became an icon of the Jazz Age as this highly portable and relatively inexpensive instrument also proved popular with amateur players throughout the 1920s, as is evidenced by the introduction of uke chord tablature into the published sheet music for popular songs of the time (a role that would eventually be supplanted by the guitar). A number of mainland-based instrument manufacturers, among them Regal, Harmony, and Martin, added ukulele, banjolele, and tiple lines to their production to take advantage of the demand. From the late Forties to the late Sixties, a plastics manufacturer named Mario Maccaferri turned out about 9 million toy ukuleles. A lot of the instrument's popularity was cultivated via "The Arthur Godfrey Show" on television. Search the Internet for ukulele songs, chords and tabs/tablatures. Indexing the largest variety of ukulele songs from well-known artists. UkuleleSongs.com is the number one source for Uke, Ukulele Chords, Ukulele Music, Ukulele Songs, Ukulele Tabs, Ukulele Music, and Ukulele Tuning.